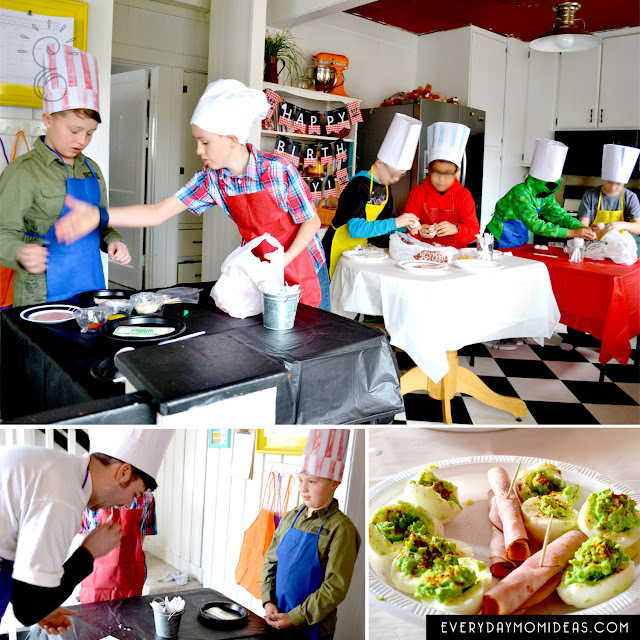 My kids and I have been binge watching Cutthroat Kitchen on Netflix so my eleven year old son begged me for a cooking party for his up coming birthday. Then we decided it would be awesome if it was a Cutthroat Kitchen Themed party with three rounds and sabotages throughout. To make it a little more kid/party friendly we decided to divide the kids up into three teams and to do points instead of eliminations so that all the kids can participate in all three rounds. This is a great game for kids ages 10 and up because at this age they are just really starting into learning about cooking. 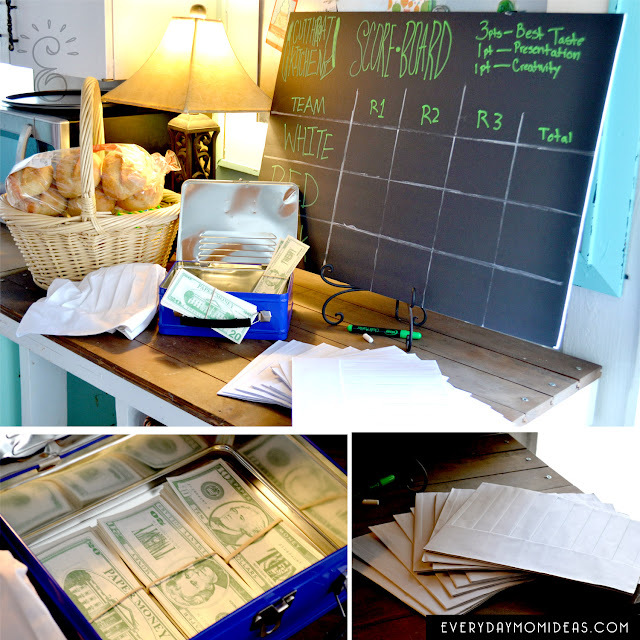 You can even play this with big family gatherings and parties. It would even make a great date night game with all your coupled up friend. The set up is pretty minimal since we already have a kitchen. We used three small tables for each team and tried to color code the teams to make things more simple. 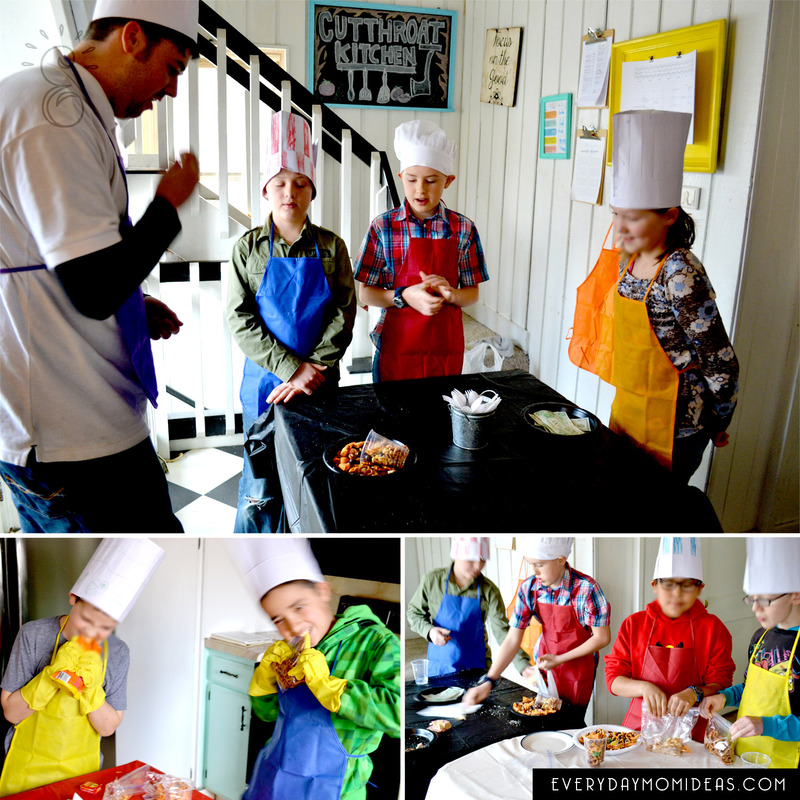 Each little contestant got an apron and a Paper Chef Hat to decorate at the beginning of the party. Decorating the chef hats were a great way to pass the time while waiting for all the guest to arrive. The hats and aprons also doubled as a fun take away gift for all the kids to keep. We just needed a few little details to give it that little extra something. The invitations were a lot of fun to design while trying to incorporate some of the design elements of the show. Then I designed a welcome sign and birthday banner to match. The welcome sign doubles as a reminder to parents when the party ends. 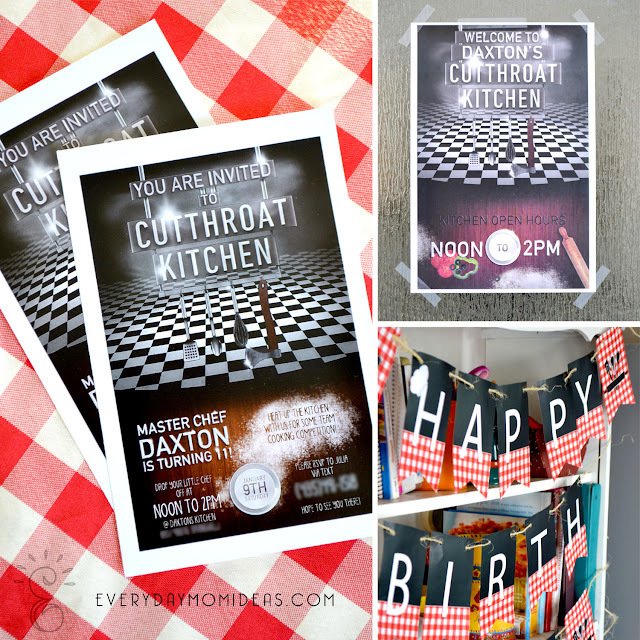 These three printable are available to custom order for your birthday party. Just head on over to my etsy shop for quick and easy ordering. The score board is set up very simple as you can see in the photo above. 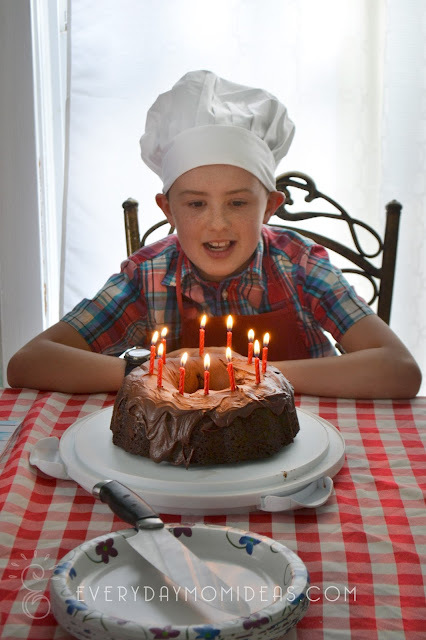 There are three rounds and three ways to score; taste, presentation, and creativity. Taste gets three points and the other two only one. The judge does not have to give each team a point. A team can win points in more than one category. 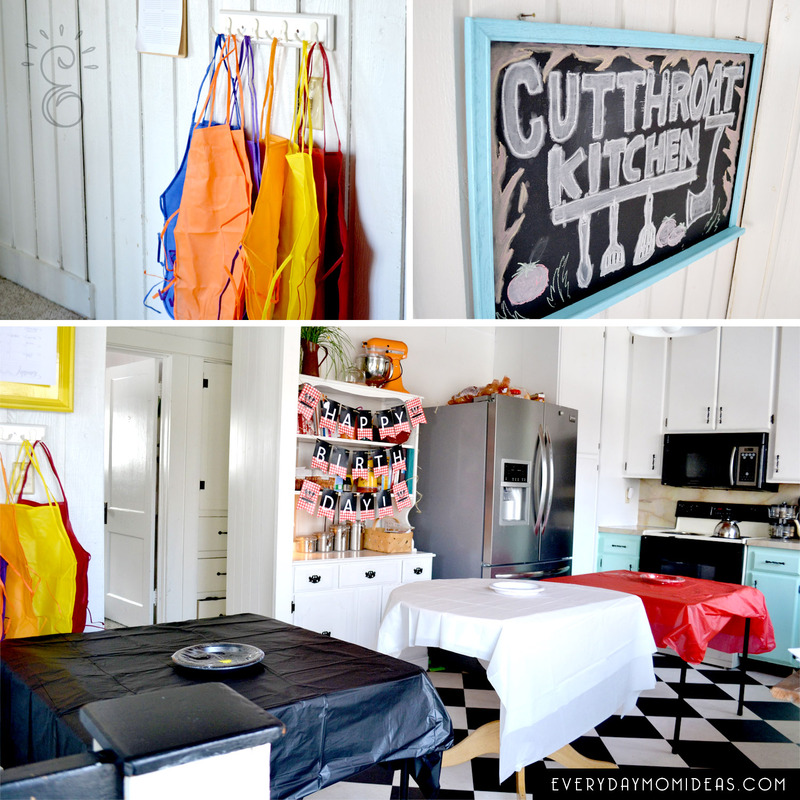 Tip: Have an adult family member be the guest judge. They are to go in the other room so they do not know how the food is prepared and what sabotages were used. Each team is given a stack of play money to use for all three rounds in order to buy sabotages to put on other teams of their choice. But they must bid for these items. The highest bid wins. Once their money is gone they can no longer bid on any future items. So there is a little strategizing involved. Each round starts with a brief explanation of the food that is to be made than each team chooses one person to run into the pantry dinning room to get all the ingredients for the dish. There are usually enough ingredients for each team to get one of each but some items only have one of them. So the quickest cook will have an advantage. To stay true to the TV show if a contestant forgets to grab an item from the pantry dinning room that is their teams lost. They cannot go back and grab missing items. Once all the team members are back at the table we move onto the sabotages. For the first and second round we had three sabotages to bid for. The final round has four sabotages. Each sabotages is explained and then opened for bidding. The highest bid wins the sabotage and gets to pick which team gets burdened with it. Tip: We instructed the kids that they are not allowed to make deals with other teams. It just creates a little more harmony. So the kids don't get stressed out. Once all the Sabotages for that round are bid on and given out we do a quick countdown to when they can start making their dish. 3. 2. 1. Go! For our first round we decided to go with Green Eggs and Ham. This is a good option for round one because there is no actual cooking involved and not a whole lot of ingredients either. We boiled the eggs ahead of time but did not peal them. The ingredients were divided up into little bowls so they could easily grab what they needed during the dinning room dash portion. Ingredients for each team: four eggs, four slices of ham, 2 TBS mayo, 1 TBS mustard, Paprika, Salt, and pepper. Food Coloring - There are three sets of food coloring, green, blue and yellow, and then red. The winner of this bid with get the only green food coloring and will get to pick what team gets the blue and yellow die, and what team only gets red die. The food coloring must be used on the dish in some way. Ham Substitute- The winning team to bid on this gets to pick which team gets their ham taken away. Instead of the ham slices it must be replaced with canned Vienna sausages. Rope-One team will be tied all together at back to back for the entire round. We thought this would make a great option for a second round because it required no cooking as well and we could use lots of fun ingredients. Ingredients: nuts, corn nuts, pretzels, chocolate, raisins, dried fruit, dummies, sun flower seeds. Rubber gloves: One team had to wear big rubber gloves for the whole round. Fine motor skills go out the window and it makes opening any packages very difficult. Dried Edamame beans: The kids were totally grossed out with these dried beans probably just because they had never tried them before. You could easily just add a strange ingredient that they must incorporate in their dish. Pop Tarts: This was a fun sabotage because its an ingredient completely out of the ordinary and they had to get creative to use it. This is the only round where cooking was involved. Like most families we only have one stove. Having a bunch of kids around one stove trying to cook their dish on a dead line is not a good idea. But for this pizza round it worked out great. 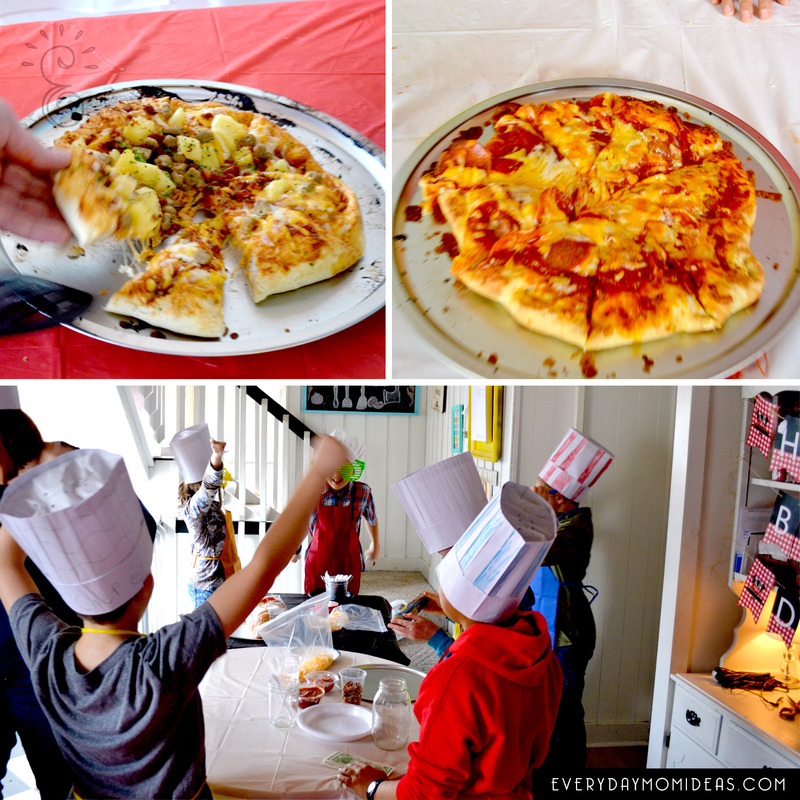 We just had the kids make their pizzas and then we baked them in the oven for them. Ingredients: ready made pizza dough, pizza sauces, separate bags of shredded cheese, and various toppings. Tip: only provide one or two of each variety of toppings and sauces so the kids will have to make different kinds of pizzas. French Bread: Once team must substitute their pizza dough for already cooked french bread. Big funny glasses: One team must wear these big funny glasses for the entire round. Broccoli: One team must use broccoli in their dish. Glass jar: One team must use a glass jar to roll out their dough instead of a rolling pen. While the pizzas where cooking we opened presents. 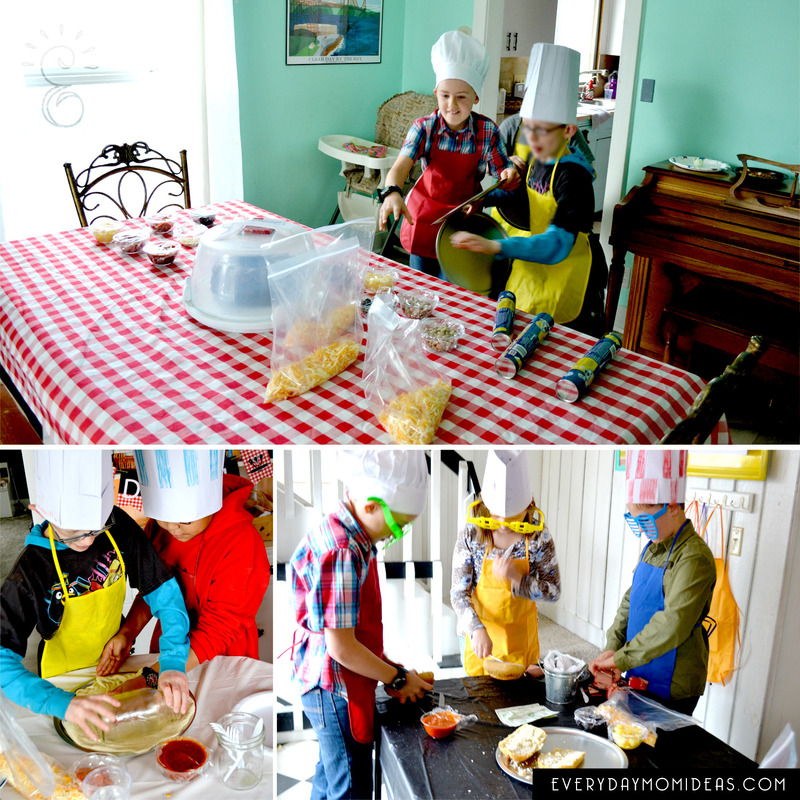 The entire party was two hours long and the kids were so engaged with cooking that it all just flew by. Once the guest judge taste tested the pizzas and gave out his final points the winning team was awarded with a prize. Then we all enjoyed getting to try all the different pizzas. They were actually quite good. We ended the birthday party with a gourmet chocolate cake for the birthday boy. Wow, exceptional post! 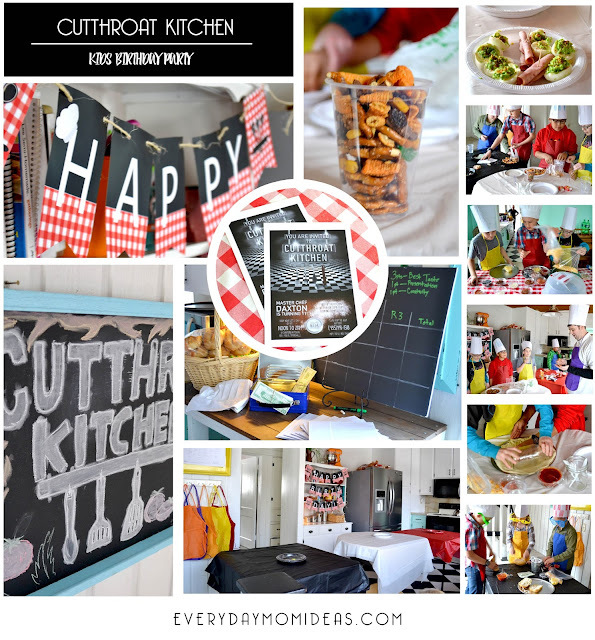 I hear for first time of kitchen birthday party. To see kids party, I am inspired. Even I also will also do that. French Bread, Big funny glasses, Broccoli and Glass jar are also really delicious after cooking these excellent recipe I love this post. So, thank you so much for sharing this mind-blowing post! Hi!! Do you still have the invitations for this party available on your etsy page? I couldn't find them!! Thanks!